I listen to catholic podcast while I work, this is my quality time with god and for self reflection. I heard her podcast today and after listening to how she talks about people being dressed for church and her disgust. I will not be listening again. The lord loves and looks at everything with a sense of compassion. I’m disappointed that I come to learn more about this faith and practices and instead felt like you judged me for having tattoos without even knowing me! Don't waste your time subscribing! It doesn't appear this show is being made anymore and you can't even listen to past podcasts. It's just a pitch for money. Complete waste of a little download space when it downloads only the apology for not being able to download the session! And it's unclear where the donation can even be made. I clicked subscribe and it downloaded all the 'podcasts' as 23-second blurbs saying that the allotted number of downloads have been made for the month IT IS MAY 1ST TODAY. The podcasts continue on, referring you to another site on which you are instructed to make a 'small donation to continue enjoying these podcasts' but as far as I can tell the site can neither take a donation linked to this particular podcast nor will it let you download to your iTunes account/iPhone/iPod etc. I'd rather be charged through iTunes. At least that would be straight-forward. So disappointing. Amazing! It's so cool to be Catholic! It's still free! I was able to download all these wonderful podcasts for free without any problems. Meg's understanding of Bible and church history is amazing! The classroom setting makes you feel like you are part of the class too. I bought the textbooks to follow along with the class. I also downloaded Dr. James Dobbins Catholic Apologetics, (who is in Meg's class). Ive tried to listen and download this podcast a frw times and all I get is an anoying recording about making a contribution at some web sit. If you want to charge for the podcast just do it dont say its free and then ask for a donation. Its dishonest. I really enjoy this Podcast! The host knows the Catholic Faith & is a great speaker & teacher. Ths participants are thoughtful, educated and a joy to listen to as well! 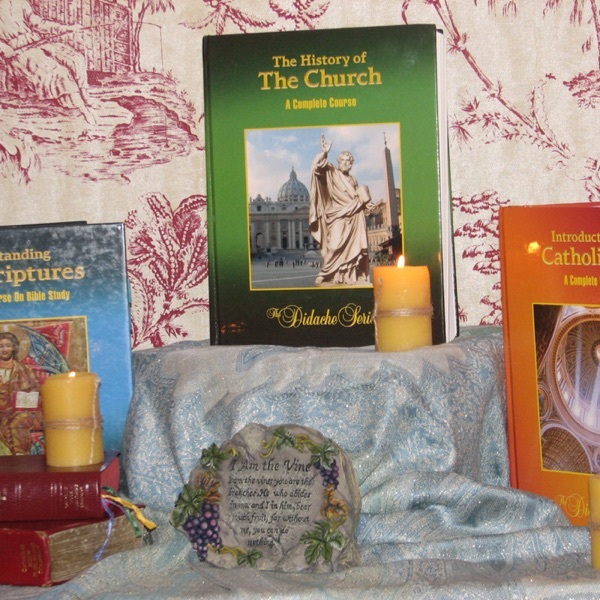 I was not Catechized & am patiently waiting RCIA, so I was thrilled to find these podcasts! I am learning so much & cant wait to get the book to accompany the lessons! 5 Stars!!!!! The lady teaching the course is wonderful, knowledgable, and not condescending. There are occasional lulls when students in the class insist on inserting their comments. I would prefer a straight lecture from Meg, but she is too polite to tell them that silence is golden. The material was pretty good, although the recording quality left something to be desired (hence 3 stars instead of 4). Again, not bad, but as far as Catholic Bible study podcasts go I would recommend St. Irenaeus Ministries over this. This is a humble, heartfelt podcast set in a Bible belt Bible study class. The discussion leader is an engaging, thoughtful woman of deep faith, a convert to Catholicism from the Southern Baptist church. In this setting, it is not surprising that discussions often veer toward the experience of being Catholic in a Protestant community-- needing, for example, to explain and, to some extent, justify the Mass to people who have never seen one. Discussion participants are thoughtful, interested, and interesting and the discussions that result are a wonderful exploration of Scripture in our lives today. This is an awesome suppliment to the book. Even without the book, a person can learn so much!